Act fast, efficient and violent. Strong words coming from such an even-tempered man. These are the three ways Sensei Frank Williams wants his students act if they are confronted and physically attacked on the streets. Williams, 54, has been practicing martial arts for 48 years since he was a child growing up in Dayton, Ohio. He is a seventh level black sash in Philippine Arneis and is a senior master in jujutsu. Before Williams worked primarily as a martial arts instructor, he served time in the United States Army on the Anti-Terrorist Tactical Alert Team as well as serving as a sheriff’s deputy in Montgomery County, Ohio. Now in his middle-ages, Williams’ laid-back style and unique training methods have been drawing people to Sentou Dojo since 2006. The original Sentou Dojo opened in 2006 on Fairview Avenue in Bowling Green before moving to its current location due to increased business and popularity. Williams has been a dojo operator for 38 years and has stated he had wanted to open a dojo ever since he was old enough for a business license. Sentou translates to battlefield in Japanese. Battlefield fighting styles are what Williams’ and his instructors mainly focus on teaching. Williams strongly believes in self-defense training and offers classes for both men and women. Williams would rather teach a smaller framed person how to protect themselves from danger rather than train them for competitive tournaments. Williams credits his tough upbringing for indirectly steering him toward martial arts. Williams’ recalls as a child that a neighborhood altercation with some older teenagers led to his father enrolling him in martial arts classes to help fend off future attackers. Upon first impression, Williams is unassuming, coming off as your everyday working man, but he is passionate about his craft and his beliefs. His short black haircut and clean-shaven face reflect his serious nature. However, his calm demeanor and positive disposition make you feel invited from the moment you step inside the dojo. When he’s instructing, Williams sports an all-black traditional Japanese gee with the words Sentou Dojo printed across the back in stitched red lettering. Williams’ black belt blends into his all-black gee. This may be because the black belt doesn’t define Williams; martial arts is just his craft. The black belt is simply another part of the uniform. While his black belt rankings are meaningful to him, he doesn’t want to be arrogant, he said. In many ways, the inside of the dojo mirrors Williams’ calm and reverent personality. When you walk inside the dojo, you immediately notice the tranquil vibe that fills the open room. Traditional Japanese meditation music plays over the speakers, but you don’t notice it while inside. It just enhances the soft ambiance. The sparring area is vast with two considerably large blue mats covering a majority of the open floor. The white walls contrast the blue floor mats, which are the loudest things in the entire dojo. There are only a few items hanging from the walls. One is a large American flag, symbolizing Williams’ love for his country and representing the four years he spent in the U.S. Army. Perhaps the most meaningful item on the wall to Williams hangs directly in the middle of the center wall facing the entrance. Patrons can notice it as soon as they walk in the door. The item is a blue blanket inscribed with the 10 Commandments. “I’ve been a practicing Christian pretty much my whole life; since about the age of 12 when I was saved,” said Williams. “Southern Baptist. My faith is everything to me. For me, it’s God first, then my family, then country. Teaching martial arts in a respectful manner is one of the values Williams’ strives to enforce in his daily classes. Williams attributes many of his virtues to his Christianity. Williams has been a devout Christian since his early childhood. His faith remains a large influencer for his teaching methods. Williams is very open and up-front about his faith. It grounds him. He wants his students to be comfortable while he is instructing. Williams’ incorporates rules such as no screaming, no cursing and no bad behavior. Students are expected to respect the rules of the dojo or face repercussions from the Sensei. These rules help Williams maintain a soothing learning environment for all students. Williams finds that students learn better in a calmer environment. With all distractions absent from the dojo, Williams can focus on giving each student the personalized attention they need to properly learn. Williams’ strongly emphasizes the kind of individual he wants attending his dojo. Williams wants students that reflect positively on himself, his faith, and his business. Dunne, 48, has been with Sentou Dojo since 2007. Dunne first heard of Sentou Dojo while driving his daughters to a guitar lesson. While they wanted to take up other activities, Dunne personally thought it would be beneficial for them to take up learning a martial art. Eleven years later and they’re still coming back. Something Williams emphasizes about his martial arts teachings is its application to real life. What Williams teaches is practical and is something you could utilize in a real-life altercation. Dunne echoes this sentiment with an anecdote regarding a situation in which one of his daughters used one of Williams’ techniques to her advantage, just not in a fight. Williams believes it’s important for people to be able to protect themselves when out on the streets. His demonstrations are precise and focus on targeting specific weak-points on your attacker’s body. Sensei Frank Williams, 48, teaches two young students how to fend off a knife attack. 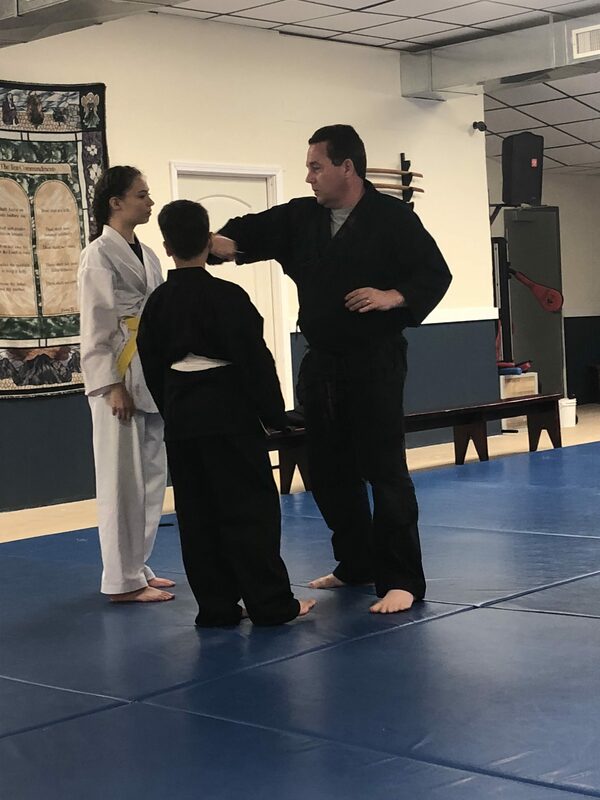 During a recent lesson, Williams and Dunne were successfully teaching younger people how to disarm an attacker with a knife. To do this, Williams demonstrated by allowing Dunne to sit on top of him, pinning his back to the ground. Williams calmly explained his technique to the class. Within seconds, Williams showed the proper method of disarming Dunne who was using a fake knife as a prop to symbolize the danger. The class enthusiastically followed suit, performing the technique. Williams’ teachings could be more applicable now than ever before. Horrid sexual assault allegations and sexual misconduct rumors are dominating the mainstream news cycle. While learning martial arts or self-defense techniques may not be the perfect answer in preventing violence toward yourself, it’s still a viable solution. Williams is passionate about his craft and has no current or future plans on retirement. Williams said he contemplated retirement after he finished being a sheriff’s deputy, but caved after one month of boredom. “If God wills it and I’m here in my 90s, I’ll still be throwing people around,” said Williams with a smile.